With the convergence of digital device technology, merging data-centre printing and reprographics print room operations has become a possibility and one which can enable rationalisation of production print hardware to gain better utilisation and improved return on investment. 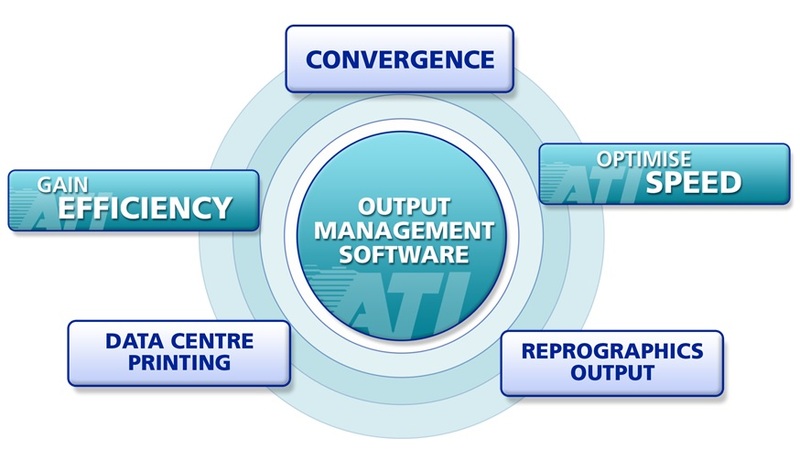 ATI software, by being able to manage both transactional variable data jobs and document jobs, can facilitate such convergent strategies by enabling output management of both types from the same common print room console. As an “open system” docQmanager works with any Windows supported device providing complete control over jobs and print queues in the CRD/Print room, whether they are transactional variable data jobs or job ticketed document jobs . Simple and easy to use it enables you to manage, prioritise, copy and move jobs between print queues with the click of a mouse. It can split and cluster jobs across queues for increased throughput. Processes and workflows may be automated to match individual operational requirements, including automated job archive and deletion for efficient job housekeeping. To retain the benefit from the power of modern device drivers for job imposition and colour management, ticketed jobs are output using the relevant manufacturers’ device driver. To optimise operator efficiency and minimise errors, output device drivers are configured automatically by the docQticket system using job profiles determined from the job parameters set within the ticket. This functionality applies equally to Fiery controllers and manufacturers’ own device drivers. Jobs may be previewed before printing and browsed through by page as required to facilitate reprint of a page or parts of a job without reverting to the host application. Two optional docQview modules enable PCL and PostScript encoded jobs to be similarly previewed before printing and to facilitate reprints. Photocopying hardcopy still persists in reprographics print rooms. ATI hardcopy job ticketing enables the submission and processing of such work to be managed through the print room and costed and accounted for using the same job ticketing system as for electronic jobs. All managed through the same print room console. Where jobs include colour, they can be split to speed the production process and reduce cost of production . Running on the CRD print server, the optional docQsplit module automatically separates the colour pages from the black and white pages within a job and sends each to appropriate print queues within docQmanager. With the right chosen output device jobs may be automatically collated by machine. Alternatively they may be manually recompiled following the printed instructions automatically generated by the ATI software. The process status of any job within the system may be updated by operators as it moves through the print room. This can be particularly useful where shift operation is involved and knowledge of the status of any job is required for clean hand over between shifts. The job status can form part of a central print room job activity dashboard display as well as be displayed, if required, on a private web page for access by individual users to view the progress of their own jobs. All output activity may be tracked and reported for inclusion in external reporting systems. Uniquely, ATI job ticketing software integrates with the leading network print cost recovery systems, including Equitrac, PaperCut, Pcounter, SafeCom and YSoft SafeQ. This enables total and consistent cost/client billing capability right through the organisation whether jobs are printed on the departmental network or in the CRD print room. Job ticket submission is either by way of “file/print” from the application or file upload via web browser. All licensed users have the option of both methods if so required. Clean job ticket design and mandatory fields make misunderstandings between user and the CRD print room history. Each job sent to the CRD contains a comprehensive set of job parameters detailing what printing, finishing and delivery are required. Features such as: duplex or single-sided, stapled or punched, colour or b&w, style of envelope and mailing instructions,…. each can be defined, along with page exceptions and other special requirements. Network users can preview their job at their desktop before submission to see exactly what CRD will receive. Job submission licencing is by named user and gives all licenced users access to both “file/print” and web upload submission. The client user software may be installed on any number of machines throughout an organisation and in this way licensed users have full flexibility to submit work by either method from any suitably enabled device anywhere on the network. Using the docQcollate module option users can combine multiple documents from different applications, including PDFs, into a single job ticketed job for submission to the CRD print room. Typical applications include the preparation and submission of documentation like meeting agenda and minutes with attachments. Job tickets can be customised with graphics and logos to meet corporate, departmental or user needs. Many are designed to include a pre-submission job cost estimating function for the user.